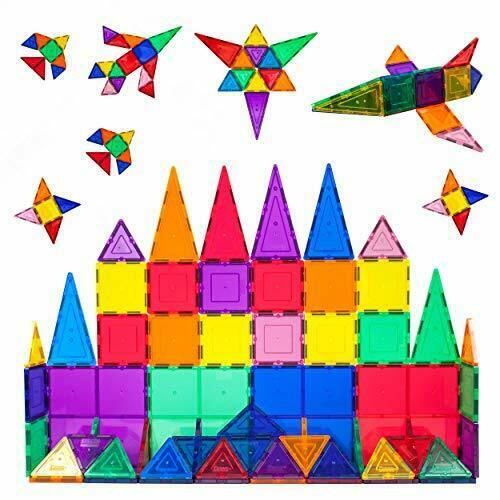 PicassoTiles® 60 Piece Set Magnet Building Tiles Clear 3D Color Magnetic Building Blocks - Creativity Beyond Imagination! - Educational, Inspirational, Conventional, and Recreational! - Suitable for all ages (3+ and up) by one party of in groups a great way to spend quality time with the family and loved ones. - Feel the sense of achievement together - bonding by building with Picasso Tiles. - No limitations, scalable to build as big as desired by adding more pieces. Picasso Tiles in colossal styles. - Never too early to start developing kids creativity at a young age, Picasso Tiles offers learning through playing. Children will acquire a strong sense of color, geometrical shapes including 3D forms numbers counts, magnetic poles. - Encourage creativity which is the key factor to success in today's every changing environments. - Fun and entertaining, perfect educational presents for school age children that will never go out of style. - Entertaining for single or multiple parties, great for parent-to-child bonding with hours of fun quality time. Easy to construct and easy to put away for storage. - Learning is Fun! It's never too early to start developing kids creativity at a young age, Picasso Tiles inspire youngsters learning by playing, as well as the creativity which is the key factor to success in today's ever-changing environment. Give the youngsters a head start. - Unlike typical toys, each piece of tiles can be replaced and more tiles can always be added to build objects as big as desired.